First Visitation for Billie Jo Edwards will be 4-8 PM Saturday, May 5, 2018 at the funeral home. Second Visitation for Billie Jo Edwards will be 12-8PM Sunday, May 6, 2018 at the funeral home. Services to celebrate her life will be 1:00 PM Monday, May 7, 2018 at Saint Andrew's United Methodist Church (2727 SW 119th Street, Oklahoma City, OK 73170). 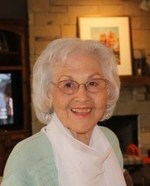 Billie Jo Edwards, of Oklahoma City, died May 3, just four days after celebrating her 88th birthday. She was born in Bokoshe, OK, the daughter of Mary Lee and Joe Morton. She was working the counter at Hyde Drugstore after high school, when Allen Edwards came in to buy a comb, and eventually won her heart. They were married in 1949 and had two children, Monty and Jola. In her younger years, Billie enjoyed golf, bridge and traveling with friends. She was a wonderful mother and set a great example for her children. She loved them dearly and enjoyed their activities. She joined Allen as owner/operators of Al’s Bar-B-Q. They grew the business from drive-in burgers and fries to a well -regarded restaurant serving some of OKC’s best BBQ and steaks. She retired and sold the restaurant a few years after Allen passed away. Grandchildren and great grandchildren brought her tremendous joy, and she was so proud of them. After moving to assisted living five years ago, Billie enjoyed making new friends, watching Thunder basketball games and playing bingo. She had a determined spirit and strong faith, both serving her well as her health declined. Billie is survived by daughter, Jola Milligan, and son-in-law Dan, Oklahoma City; grandchildren Lauren Sorgen and her husband Bryan, Edmond; Olivia Edwards, Edmond; Derek Milligan and his wife Sarah, Wichita, KS; Mitchell Milligan and his wife Sara, Garland, TX; and Grady Milligan, Oklahoma City; great grandchildren Landon, Nash and Savannah Sorgen, Edmond. She was preceded in death by husband Allen (1989) and son Monty (2018). To send flowers to the family of Billie Jo Edwards (Morton), please visit our Heartfelt Sympathies Store.